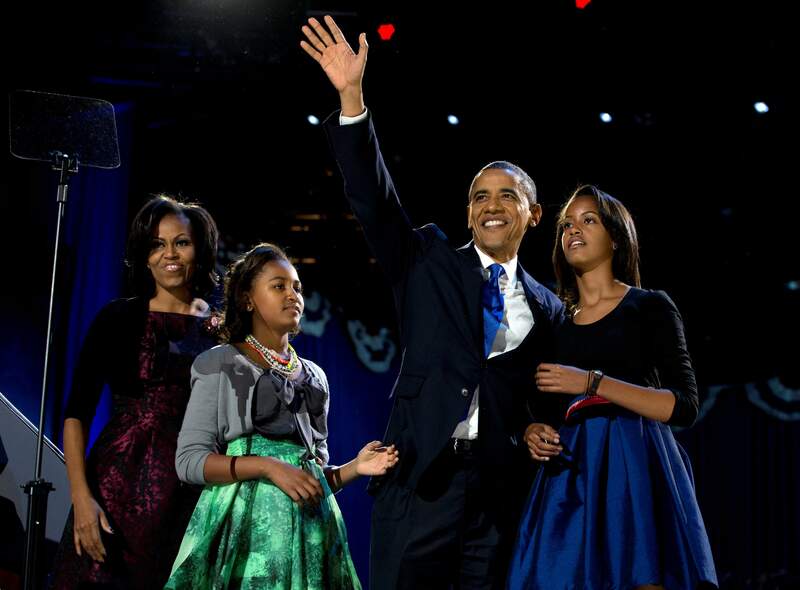 President Barack Obama waves as he walks on stage with first lady Michelle Obama and daughters Malia and Sasha at his election night party Wednesday in Chicago. Obama defeated Republican challenger former Massachusetts Gov. Mitt Romney. WASHINGTON  President Barack Obama rolled to re-election Tuesday night, vanquishing former Massachusetts Gov. Mitt Romney despite a weak economy that plagued his first term and put a crimp in the middle-class dreams of millions. This happened because of you. Thank you Obama tweeted to supporters in celebration. Romney telephoned the president, then spoke to disappointed supporters in Boston. In a graceful concession, he summoned all Americans to pray for Obama and urged the nights political winners to put partisan bickering aside and reach across the aisle to tackle the nations problems. After the costliest  and arguably the nastiest  campaign in history, divided government seemed alive and well. Democrats retained control of the Senate with surprising ease. Republicans did the same in the House, ensuring that Speaker John Boehner of Ohio, Obamas partner in unsuccessful deficit talks, would reclaim his seat at the bargaining table. At Obama headquarters in Chicago, a huge crowd gathered waving small American flags and cheering. Supporters hugged each other, danced and pumped their fists in the air. Excited crowds also gathered in New Yorks Times Square, at Faneuil Hall in Boston and near the White House in Washington, drivers joyfully honking as they passed by. With returns from 79 percent of the nations precincts, Obama had 52.2 million, 49.5 percent. Romney had 51.7 million, 49 percent. Obama won Colorado by less than 3 percentage points. With slightly less than 2 million votes counted, he had 50.24 percent of the states vote. Television networks projected Obama the winner of the national contest about the time it became clear he would win Colorado. Gov. John Hickenlooper was a vocal supporter of Obama this summer and fall, and he spoke to jubilant Democrats in Denver on Tuesday night. Lets remember that this is one country. Our real work begins tomorrow, Hickenlooper said. The presidents laserlike focus on the battleground states allowed him to run up a 303-203 margin in the competition for electoral votes, where the White House is won or lost. It took 270 to win. The election emerged as a choice between two very different visions of government  whether it occupies a major, front-row place in American lives or is in the background as a less-obtrusive facilitator for private enterprise and entrepreneurship. The economy was rated the top issue by about 60 percent of voters surveyed as they left their polling places. But more said former President George W. Bush bore responsibility for current circumstances than Obama did after nearly four years in office. That boded well for the president, who had worked to turn the election into a choice between his proposals and Romneys, rather than a simple referendum on the economy during his time in the White House. Unemployment stood at 7.9 percent on Election Day, higher than when he took office. And despite signs of progress, the economy is still struggling after the worst recession in history. Romney won North Carolina among the battleground states. Florida was too close to call, Obama leading narrowly in a state where there were still long lines of voters at some polling places long after the appointed closing time. Obama won in the reliably Democratic Northeast and West Coast. Pennsylvania was his, too, despite two late campaign stops by Romney. Romney won most of the South as well as much of the Rocky Mountain West and Farm Belt. The president was in Chicago as he awaited the voters verdict on his four years in office. He told reporters he had a concession speech as well as victory remarks prepared. He congratulated Romney on a spirited campaign. I know his supporters are just as engaged, just as enthusiastic and working just as hard today, he added. Romney reciprocated, congratulating the man who he had campaigned against for more than a year. Earlier, he raced to Ohio and Pennsylvania for Election Day campaigning and projected confidence as he flew home to Massachusetts. We fought to the very end, and I think thats why well be successful, he said, adding that he had finished writing a speech anticipating victory but nothing if the election went to his rival. But the mood soured among the Republican high command as the votes came in and Obama ground out a lead in critical states. Like Obama, Vice President Joe Biden was in Chicago as he waited to find out if he was in line for a second term. Republican running mate Paul Ryan was with Romney in Boston, although he kept one eye on his re-election campaign for a House seat in Wisconsin, just in case. He won re-election to Congress. The long campaigns cost soared into the billions, much of it spent on negative ads, some harshly so. In a months-long general election ad war that cost nearly $1 billion, Romney and Republican groups spent more than $550 million and Obama and his allies $381 million, according to organizations that track advertising. According to the exit poll, 53 percent of voters said Obama was more in touch with people like them, compared to 43 percent for Romney. About 60 percent said taxes should be increased, taking sides on an issue that divided the president and Romney. Obama wants to let taxes rise on upper incomes, while Romney does not. Other than the battlegrounds, big states were virtually ignored in the final months of the campaign. Romney wrote off New York, Illinois and California, while Obama made no attempt to carry Texas, much of the South or the Rocky Mountain region other than Colorado. There were 33 Senate seats on the ballot, 23 of them defended by Democrats and the rest by Republicans. Democratic Rep. Chris Murphy, a Democrat, won a Connecticut seat long held by Sen. Joe Lieberman, retiring after a career that included a vice presidential spot on Al Gores ticket in 2000. It was Republican Linda McMahons second defeat in two tries, at a personal cost of $92 million. The GOP needed a gain of three for a majority if Romney won, and four if Obama was re-elected. Neither Majority Leader Harry Reid of Nevada nor GOP leader Mitch McConnell of Kentucky was on the ballot, but each had high stakes in the outcome. All 435 House seats were on the ballot, including five where one lawmaker ran against another as a result of once-a-decade redistricting to take population shifts into account. Democrats needed to pick up 25 seats to gain the majority they lost two years ago. House Speaker Boehner, R-Ohio, raised millions to finance get-out-the-vote operations in states without a robust presidential campaign, New York, Illinois and California among them. His goal was to minimize any losses, or possibly even gain ground, no matter Romneys fate. House Democratic leader Rep. Nancy Pelosi of California campaigned aggressively, as well, and faced an uncertain political future after her party failed to win control. In gubernatorial races, Republicans picked up North Carolina, where Pat McCrory won easily. The incumbent, Democratic Gov. Bev Purdue, did not seek re-election. In a campaign that traversed contested Republican primaries last winter and spring, a pair of political conventions this summer and three presidential debates, Obama, Romney, Biden and Ryan spoke at hundreds of rallies, were serenaded by Bruce Springstein and Meat Loaf and washed down hamburgers, pizza, barbecue and burrito bowls. Obama was elected the first black president in 2008, and four years later, Romney became the first Mormon to appear on a general election ballot. Yet one mans race and the others religion were never major factors in this years campaign for the White House, a race dominated from the outset by the economy. Over and over, Obama said that during his term the nation had begun to recover from the worst recession since the Great Depression. While he conceded progress had been slow, he accused Romney of offering recycled Republican policies that have helped the wealthy and harmed the middle class in the past and would do so again. Romney countered that a second Obama term could mean a repeat recession in a country where economic growth has been weak and unemployment is worse now than when the president was inaugurated. A wealthy former businessman, he claimed the knowledge and the skills to put in place policies that would make the economy healthy again. In a race where the two men disagreed often, one of the principal fault lines was over taxes. Obama campaigned for the renewal of income tax cuts set to expire on Dec. 31 at all income levels except above $200,000 for individuals and $250,000 for couples. Romney said no ones taxes should go up in uncertain economic times. In addition, he proposed a 20 percent cut across the board in income tax rates but said he would end or curtail a variety of tax breaks to make sure federal deficits didnt rise. The differences over taxes, the economy, Medicare, abortion and more were expressed in intensely negative advertising. Obama launched first, shortly after Romney dispatched his Republican foes in his quest for the party nomination. One memorable commercial showed Romney singing an off-key rendition of America The Beautiful. Pictures and signs scrolled by saying that his companies had shipped jobs to Mexico and China, that Massachusetts state jobs had gone to India while he was governor and that he has personal investments in Switzerland, Bermuda and the Cayman Islands. More than 30 million voters cast early ballots in nearly three dozen states, a reflection of the growing appeal of getting a jump on the traditional Election Day. Herald Staff Writer Joe Hanel contributed to this report.